The adverse effects have been minimized, the poorer sections of society that were often un-banked will benefit through new social support payments. India is a preferred partner country. Our talks to establish a Free Trade Agreement (FTA) are proceeding well. The Indian regions were becoming more joined-up via infrastructure projects as well as through commercial and entrepreneurial development. We need to tenaciously stand for democracy, the rule of law and freedom, even in adverse circumstances. India is moving from a largely manual-labor era towards a new modernity which causes some discontent and will take some years to work through. India suffers a 20 percent cost imposition on logistics compared to European rates and the way to reduce this is to organize regulations. The new GST will help, but so would the effective adoption of the UN/TIR system that accredits the truck, driver and contents. The Modi government is environmentally sensitive but that transport and labor laws and labor reskilling need to be regularized to allow firms to become more effective. India is competing effectively globally which could be enhanced if it invested more strongly in hard and soft infrastructures, with all firms working to be best in class. The Swiss education system with less focus on sending all to university allows most young people to develop their skills in apprenticeships – learning while working and being paid. Ultimately an apprentice could rise to be a CEO. Education in India is too controlled by the state with old concepts from the Soviet times lingering in planning systems. Instead, a well-managed state/private mix could be allowed. Globalizing growth is needed to raise India’s national income to be able to give better support to education, social services. Stronger integrations such as e-payment systems with both governments and businesses will boost confidence as well as growth. India is on the edge of a large boost to its performance – with the rationalization of inter-state trading due to the GST with a consequential increase in tax revenues leading to increased spending on better infrastructures: a benefit all round. 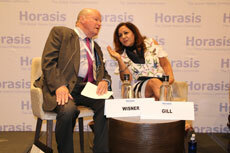 The 2018 Horasis India Meeting took place in Malaga, Spain on 24-25 June. 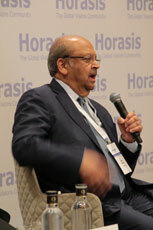 More than 300 members of the Horasis Visions Community gathered to jointly inspire India’s future. Co-hosted by the City of Malaga, the Provincial Government of Malaga and the Confederation of Indian Industry (CII), the 2018 Horasis India Meeting explored Indian firms’ rise to global eminence while debating how to grow India’s economy rapidly and sustainably. Delegates also examined how to use Spain and Europe as springboard for globalization. A major facet noted by delegates was India’s continued rapid growth as shown in its GDP figures – now it is the world’s fastest growing economy. Download the report and visit the photo gallery. Speaking on behalf of City of Malaga, Francisco de la Torre, Mayor of Malaga, Spain, welcomed participants to both start and continue discussions to further build on existing links between the City and India. Borja Gonzalez del Regueral, Vice Dean, IE School of Human Sciences and Technology, Spain conveyed that ‘India holds great promise for economic engagement with Spain. Rakesh Bharti Mittal, Vice Chairman, Bharti Enterprises – on behalf of the Confederation of Indian Industry (CII) – talked about the building blocks for Spain’s and India’s shared economic and societal future. 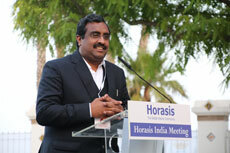 In his welcoming speech, Ram Madhav, National General Secretary, Bharatiya Janata Party, India, stressed the Indian government’s commitment to wide-ranging reforms. According to Sanjay Kirloskar, Chairman, Kirloskar Brothers, India, ‘India‘s economy is robust, resilient and has potential to deliver sustained growth.‘ Mary V. Andringa, Chair of the Board, Vermeer Corporation, USA was confident that India will increase its attractiveness for foreign direct investment. ‘We need to accelerate the reform process to improve the investment climate,’ conveyed Prakash Hinduja, Chairman Europe, Hinduja Group, Switzerland. 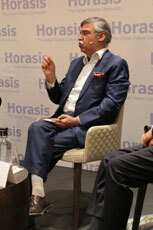 ‘Structural reforms to bolster resilience to shocks are necessary to increase India’s competitiveness,’ commented Sunil Kant Munjal, Chairman, Hero Corporate Services, India. Reflecting on India’s continued rise, Vishal Chordia, Minister of State, State of Maharashtra, described Mumbai as the world’s emerging financial hub. He also called Maharashtra a hot-bed for entrepreneurship and innovation. In similar vein, B.V.R. Mohan Reddy, Executive Chairman, Cyient, India, expressed confidence that India is going to be the world’s new economic growth engine, despite the rising protectionism elsewhere in the world. 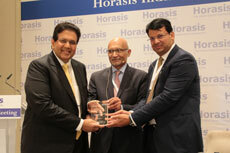 Arun M. Kumar, Chairman and Chief Executive Officer, KPMG India, presented the prizes awarded by Horasis and KPMG to the Indian Business Leaders of the Year. This year the award winners were Dilip Piramal, Chairman, VIP Industries and Salil Singhal, Chairman-Emeritus, PI Industries. Introduced 10 years ago, the meeting has become the foremost annual meeting of Indian business leaders and their global counterparts. 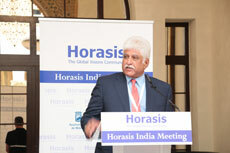 With this meeting, Horasis offers business and government to discuss a wide range of issues related to the Indian economy. The location of the meeting rotates annually, and has been held in Munich (2009), Madrid (2010), Naples (2011), Antwerp (2012), Belfast (2013), Liverpool (2014), Interlaken (2015), Cascais (2016), Interlaken (2017) and Malaga (2018).